at the end of 2005 in this eBook! So is now the time to buy Real Estate? How do you determine what is a good deal? to determine if the real estate you might consider buying is a fair price. "For a succinct overview of the current housing bubble and its causes, the single best text I've found is the ebook How To Prosper In the Changing Real Estate Market"
- Charles Hugh Smith, Editor, OfTwoMinds.com, and published author. "I don't get a commission or remuneration of any kind from the author or publisher; I just think he's assembled a thorough, easy-to-read and well-documented report which supports the thesis that this is truly a bubble of epic proportions. It's well worth the $12 you're asking. Congratulations on a fine bit of writing on complex topics." In a short period of time I'm going to show you everything you need to know about the real estate market to determine how to capitalize on the current real estate market, and protect yourself from the bubble bursting before it is too late. I have no idea whether you own your own home, own investment properties, or are simply looking to buy real estate and don't want to make a poor decision, but that's not important. What I teach in the eBook is useful for everyone who owns real estate or is thinking of buying real estate. So how do you protect yourself and prosper in the changing real estate market? It is relatively simple, if you know how. All it takes is seeing an overview of the real estate market, the big picture of your present financial situation, and using techniques taught in the eBook to protect yourself and maximize the net value of your real estate, and it's easier than you ever imagined. The $64,000 question is, "What exactly do I do now while there is still time?" Don't worry at all. Because I have written an easy-to-understand eBook that reveals, in plain English, everything you need to know about the housing bubble, and all the inside techniques and tricks of the trade that I use to prosper in the real estate market so that you can protect your financial future while you still have time. The eBook is titled"How To Prosper In The Changing Real Estate Marketplace. Protect Yourself From The Bubble Now". As the title suggests, the guide is for people interested in the real estate market. The eBook is in a downloadable PDF format, so you get instant access. It is full color, with graphs, charts and pictures in each section of the eBook. You can print it in full color or read it directly on your computer. You can buy the eBook easily - click here now! The beauty of choosing the best course of action now is that you will be in a position to take advantage of other opportunities that will be uncovered as we go into the next stage of the US economy, namely recession. Once you have your finances in order, you will be able to secure real wealth for yourself and your family. And just how will you learn this? Not with boring textbook theory by so-called "gurus" who spend their days in the library. What you need is real world, tried-and-tested, proven, actionable strategies and techniques along with a brief historical background of bubble markets so you can learn from them, as history repeats itself. In the eBook you will learn everything you need to know to capitalize on the current real estate market to protect your paper real estate gains, hedging these gains so they do not disappear. Many other people besides myself are discussing the real estate market bubble, including influential businessmen, important academic authorities, and top professionals in the field. "We've had a real bubble to some degree. I would be surprised if there aren't some significant downward adjustments..."
Warren Buffet, Billionaire, Owner, Berkshire Hathoways, Omaha, Nebraska, USA (May 6, 2006). "What we see in our residential brokerage business is a slowdown everyplace. The day traders of the internet moved into trading condos, and that kind of speculation can produce a market that can move in a big way. Dumb (mortgage) lending always has its consequences. It's like a disease that doesn't manifest itself for a few weeks, like an epidemic that doesn't show up until it's too late to stop it. Any developer will build anything he can borrow against. Once a price history develops, and people hear that their neighbor made a lot of money on something, that impulse takes over, and we're seeing that in commodities and housing... Org.ies tend to be wildest towards the end." Dr. Robert Shiller, Yale Professor & Author, Boston, Massachusetts, USA (May 11, 2006). "If the real estate market does tank, it will cause a worldwide recession." Falling real estate values "will probably be spread over many countries. I have money in India, Brazil and China. So far I've been right." Dr. Shiller is famous for writing a book about the stock market bubble bursting just before it did burst in 2001. 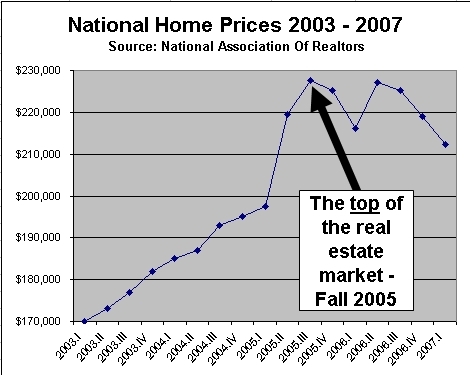 "Home prices will continue to be under pressure throughout 2007"
Dr. Mark Zandi, Chief Economist, Economy.com, Pennsylvania, USA (February 15, 2007). "The market will continue to be under pressure as the market works works through still large inventories of unsold homes. This process will be made more difficult with banks raising lending standards because of concerns about rising mortgage default rates." "The extraordinary boom is over." Alan Greenspan, Former Federal Reserve Chairman, New York, New York (May 18, 2006). "This has been quite an extraordinary boom. The boom is over. I think we can safely say that with a strong degree of confidence. (There is a) high degree of froth in the (real estate) system." "The economy may fall into recession before the end of 2007." "Was that a 'Pop' I heard?" Dr. Christopher Thornberg, Senior Economist, UCLA Anderson Forecast, Los Angeles, California, USA (May 2006). "A bubble is when the market price of an asset becomes misaligned with what the fundamentals say the asset should be worth. Eventually the harsh reality will settle in, and the markets will come to a halt. It is just a matter of time. The slowing of the market feeds on itself, not unlike the acceleration did. When the market was hot, it caused people to rush in to get a piece of the action, causing it to get hooter. Now as it cools, it will cause more people to think twice before buying, causing it to cool more. What is clear is that the downside risks are larger than the upside." "I have read many books on the subject but yours is by far the best!" "It is also of excellent value. I also found your additional e-Reports about 'Surviving A Recession', 'Gold' and 'The Collapse of the US Dollar' most informed and helpful. The real estate agents and the press are generally still very bullish, but I simply cannot see how houses can continue to increase in value when first time buyers cannot afford them. Your e-Book is truly excellent material, and a bargain at the price." "Louis Hill's ability to Explain the Housing Bubble is Extraordinary!" "I just wish that home buyers and homeowners that have used their homes like ATMs would have had a chance to review this eBook before they added to the housing bubble. "Your assessment of the current real estate market is absolutely correct." Miami, Florida, USA, (May 22, 2006). "In addition, the investment advice you give, to those who currently own property, is worth many times the price of your book. I am recommending your book to all of my associates. Please keep the updates coming and keep up the good work." "Louis Hill Does A Great Job." - Emanuel Balarie, Senior Market Strategist, Wisdom Financial, Inc., Newport Beach, California, USA, (June 6, 2006). "If you have ever doubted that we are in a real estate bubble, read this book! Louis Hill does a great job of laying out the facts and preparing you for what is going to be an inevitable burst in real estate." I would have saved over $7,500.00 in closing costs!" Miami, Florida, USA, (May 23, 2006). "I recently placed my Miami condominium on the market. I used a service that charged me $300 and 2% real estate commissions simply to place me on the MLS (Multiple Listings Service). If I had read your eBook sooner I would have uncovered the website that you recommend which only charges $199 and 0% commission. I could have saved over $7,500.00 in closing costs when selling my condo and $100.00 up front!!! I am sorry I missed out." "How little I was aware of all the pitfalls"
Los Angeles, California, USA, (May 23, 2006). "How To Prosper In The Changing Real Estate Market made me aware of how little I was aware of all the pitfalls in the changing market. Thank you for all the pertinent information that will help me head in the best direction." "What is needed to survive and succeed financially ." Nevada, USA, (June 9, 2006). "Your recession report is great, thank you very much. Overall a great look, well thought out, you cover a lot of important ideas. Enjoyed the Bubble book too! I have been doing a lot of research lately and what you write about fit's right in with what I have been learning. These are great materials for somebody coming up to speed on where we are economically, and what is needed to survive and succeed financially." Los Angeles, California, USA, (April 25, 2006). "Louis Hill's eBook and his special reports on gold and currency were a fast read, educational, and of practical use to me. "The book gave me the confidence to implement my plans. " "Absolutely cherish and quite often re-read my copy of How To Prosper In The Changing Real Estate Market....In fact, almost feel that it was written on my behalf...! As a layman in real estate issues, I found the Book interesting and amply filled with information that I can really use. After having pondered about whether to sell or not to sell properties in both Miami and New York City, the Book gave me the confidence to implement my plans. You also share knowledge on websites and other referrals, which have resulted in less complications while saving a lot of $$$ ! - Gaston Brunschwig, Owner and President, Zona Alta Projects, Miami, Florida, USA (May 23, 2006). "Sorting the wheat from the chaff"
"One of the (many) challenges I find in real estate investing is the glut of information out there and sorting out the wheat from the chaff. It's so incredibly refreshing to find an expert who can articulate his craft with clarity, get quickly to the meat, and who backs it all up with strong empirical evidence and clear logic supporting his conclusions. Nobody has a crystal ball, but when you need that edge to help reduce your risks, Louis Hill has got to be one of your best bets." - J. Tony Goulding, Pacifica, California, USA (May 24, 2006). Learn from a true real estate market insider. Hi, I'm Louis Hill, MBA. I've spent the last several years in the real estate marketplace, as a Senior Financial Analyst lending over $45,000,000.00 to developers in several areas of the US. I have a behind the scenes look at the real estate market. My field of expertise is mezzanine financing. Mezzanine financing is the money that a developer needs to get a large real estate project started that the bank will not lend. The bank will only lend the money to build the actual building, and our financing helps pay for the zoning, architecture, pre-sale costs, etc. Mezzanine financing is also called equity gap financing because it fills the gap to help get the project off the ground before construction actually starts. It allows developers to have more cash so they can build more projects simultaneously and faster. The business has been very lucrative, but in the Fall of 2005 I saw that the real estate market was beginning to take a change for the worse. I realized that a mania had been taking the real estate market too far, too fast. As a result I decided at that time to write an eBook to help people prepare for the real estate bubble bursting. Besides seeing the changes in the real estate industry and the struggle that our clients have been experiencing lately, I studied the economy and markets while pursuing my MBA in Finance. Prior to working in real estate, I was a professional stock trader and witnessed the collapse of the Internet/Dot-com bubble and the stock market bubble. So many people lost money during the bursting of the stock market bubble simply because they got caught up in the mania and were the last one holding stock when the bubble burst. I was determined that people did not need to lose money in the real estate bubble like they did when the stock market bubble burst. I recently followed my own advice given in my eBook. I analyzed my financial situation and using the techniques in the eBook calculated that I owned a Miami Beach "bubble" condo with a substantial amount of paper equity. So I sold this condo, saving thousands of dollars in real estate transaction costs by using the techniques in the eBook, and have gone to a cash-rich financial situation in anticipation of opportunities that will present themselves over the next 24 months. I now rent a "bubble" condo on Miami Beach with an ocean view, for 1/3 the price it would cost to own! Talk about peace of mind. The amount of money I earned from my "bubble" condo has made a huge difference to my financial future! Before I sold, I only had "paper gains" which probably would have disappeared over the next 6 - 18 months if I hadn't locked them in now. The eBook is not just another book on "sell your real estate now" but, a true overview of the real estate market with techniques to minimize and hedge your exposure to real estate. If your personal financial analysis shows that real estate makes up a good portion of your total financial picture then you need to act now! ...and many others. Ezinearticles.com has also named me one of their "Expert Authors". You can read the article by clicking here. Now is the time - buy the eBook using the secure shopping cart: click here now! Want a sample of what's in the eBook? 2 insider techniques on how to identify bubble real estate versus value real estate. Top 5 United States bubble markets compared side-by-side. The top 9 reasons that the real estate market is going down. Don't make the #1 mistake that many real estate investors make today. Discover 3 historical bubble markets and see how these markets provide insight into what is going on today to learn how history is repeating itself. Learn about the #1 driver of the current real estate mania and why a change in this factor will be the prick that bursts the bubble. Learn about the global real estate bubble and how that will affect the US market and economy. Learn how your job could be affected by the real estate bubble bursting. Find out ways to sell your real estate quickly, and save thousands, with several little-known yet legitimate techniques. MyHouse.com? Should you set up a website to help you sell your home? And how can you do it easily and for very little cost? The shocking truth behind "adjustable mortgages " - H0w wil these ticking time bombs effect the real estate market? The truth is going to turn your entire real estate mentality upside down! Several of the best advertising websites to sell your home for free from my personal rolodex. How to maximize these to catapult the number of potential buyers of your real estate. Learn the true impact that speculators are having on the real estate market. When will the real estate market collapse? Find out inside! Learn about the Austrian Economic Theory and how it explains why Alan Greenspan's low interest rates will lead us into a RECESSION. Home Foreclosures are rising. What does that mean to you? Record new construction will affect the market dramatically - find out how. Find out the alarming trend of pre-sale purchase cancellations. What has been happening to construction costs and how that will feed the bubble bursting. 9 tips on how to create optimized homes to maximize the potential sale price of your home - for low cost! Several websites that easily show you comparable sales prices and real estate historical sales prices, formerly information that was easily accessible only to realtors. And you will get much more! What are you waiting for? Buy the eBook using the secure shopping cart - click here now! Click on the links below for a quick sneak peek inside the eBook. Each PDF file is extracted from the eBook and requires the Adobe Acrobat or free Adobe Reader web browser plugin for access. Please notice that each link only presents one page of the topic. The rest is in the full version of the eBook. The eBook offers another 62 more information-packed pages! And you receive three free special reports on gold, foreign currencies, and preparing for recession. The eBook is NOT an advanced investment property guide. It is for real estate owners and buyers and people who are concerned about the real estate bubble. Having said that, I'm confident that even experienced real estate investors will find it useful. If you come across just one useful tip in the entire eBook that helps you make an educated decision, you will have gotten your money's worth. The eBook is NOT a magic bullet. I provide you with the foundation of what is happening in the real estate market and tell you what you need to know now. After seeing the big picture, you must decide what is the best course of action for you and your family to maximize your financial future and really take advantage of today's opportunities. of your real estate portfolio - TODAY! I don't make a living teaching people to survive the real estate bubble. That is just a tiny part of my income. I am in the real estate world every day, carefully selecting the best real estate developers with the most collateral (including their personal net worth) to lend millions of dollars to. But I also use tools, software and resources to help me invest in profitable commercial real estate projects. That's why my readers also get access to these invaluable resources, tools, and power-packed tips. It's a virtual goldmine of wealth-protecting information! There's actually much more than I have room to go into here. (68 pages in total!) But those are the kinds of high-powered, cutting-edge advantages you will find in the eBook. People have used my hot tips and techniques to see the big picture of the real estate market and save thousands. And soon, you will too! Still not yet convinced? Well, here is my PERSONAL PROMISE to you. I'm confident that your copy of How To Prosper In The Changing Real Estate Market. Protect Yourself From The Bubble Now! will be THE #1 source for you in regards to real estate. Buy the eBook using the secure shopping cart - click here now! A Fantastic value for the money! Your low investment for this one-of-a-kind eBook is just a ONE-TIME low payment of only $11.88. That's less than the cost of lunch at your favorite restaurant. Plus, you'll receive an unconditional, 90 day, 100% satisfaction, money back guarantee! This basically means if you're unhappy with your investment at anytime within the next 90 days you may request, and receive, a full refund. I originally priced this eBook at $34.98, but the time to act is running out! Now you can get all of that knowledge for just $11.88! I think you'll agree with me that this is one of the best bargains anywhere as competing books on the bubble cost between $20 - $39 (I know, I have bought and read many of them). You're probably wondering why I am charging so little if the information inside the eBook is so valuable. Learn the art of real estate bubble protection from a world-class real estate expert! You see, I don't rely on the sale of this eBook to pay the bills. EBook sales only make up a fraction of my business. I make most of my money from the tens of millions of dollars in real estate mezzaning loans lent to numerous clients. Let me ask you this question - To prosper in the changing real estat market who would you rather learn from? A) An ivy league economist sitting in his 'ivory tower' who writes about real estate, but is not in the real estate market on a day to day basis? B) Would you rather learn from a real estate executive who is in the real estate market on a day to day basis and is not caught up in the mania surrounding the real estate market, while lending over $45 million to real estate developers? What you really need to consider is what you're getting for your money - because it's more than just an eBook. Not only do you get at least 100 times your money back in value and potential real estate cost savings, but also LIFELONG valuable knowledge that will provide you with the skills to thrive in the real estate market. This is THE key to long-term financial freedom! If you were to hire a real estate broker to sell your real estate for you, you would pay several thousand to tens of thousands of dollars in commissions. Don't waste thousands of dollars on hiring someone to show your home for you. Let me to teach you how to decide if now is the right time to sell and how to do so to maximize your profits. It's NOT as hard as you think. In fact once you've read the eBook, you will be pleasantly surprised just how relatively simple it is. Now is the time to buy the eBook using the secure shopping cart - click here now! The fact that so many people are working in real estate related jobs is another sign of the bubble and many of these jobs will be in jeopardy! 1 out of 4 new jobs created since 2000 was related to real estate. If you are afraid that your job might be in jeopardy you need to read this eBook before it is too late! Once you've learned the art of identifying value real estate, you have a valuable skill which will give you a "priceless skill" FOR LIFE. And the skill is always useful as real estate has been a wealth creator for so many. And don't forget that real estate has given tens of thousands of people the opportunity to make a very good living on their own terms - I being one of those people. I know of many good real estate professionals and investors who have made millions in real estate. It is simply a matter of seeing the real estate market's big picture and learning the techniques in this eBook to get started. How To Prosper In The Changing Real Estate Market. Protect Yourself From The Bubble Now! is personally backed by my... no-B.S., no-questions-asked, I-promise-you-will-love-it, 100% satisfaction guarantee, for 90 days! Now, in case you have any remaining doubts at all, I want to make it foolproof for you. You see, I completely guarantee your satisfaction! ...to PERSONALLY GUARANTEE your COMPLETE SATISFACTION right down to the very last day of the 90 days after you receive the eBook. If at ANYTIME during those 90 DAYS you're NOT completely convinced the How To Prosper In The Changing Real Estate Market eBook has given you VALUE many times over the investment you made, I want you to ask for your money back. I will refund you every penny you paid, immediately, NO QUESTIONS ASKED. The truth is, you will NEVER have to worry about a refund. Why not? Because once you actually apply the easy-to-understand strategies and techniques explained in How To Prosper In The Changing Real Estate Market to work for you, I'm confident you'll be delighted by the results you can attain. And even if you decide to ask for a refund, you do not have to worry about me running off with your money. I own and manage a debt-free, cash-rich business. Don't delay: Purchase the Book now using the secure shopping cart - click here! Once you gain access to the eBook, the benefits begin before you even read the first page. That's because included with the eBook is the following 3 free bonuses - gifts which are in fact worth more than 3 times the price of the eBook. Free Special eReport: "How you can protect yourself with Gold"
An informative 6 page eReport explaining why gold is a good investment, especially with the possibility of recession looming. This eReport will explains ways to invest in gold as well. Free Special eReport: "How you can protect yourself with foreign currencies"
This 5 page eReport explains how to protect yourself from the decreasing confidence in the US dollar by using foreign currencies. This eReport explains ways to invest in foreign currencies as well. Free Special eReport: "Recession - How to Survive and Thrive!" This 40 page eReport explains ways to create a powerful financial plan that will guide you to success before or during a recession. It identifies the key warning signals of an impending recession. 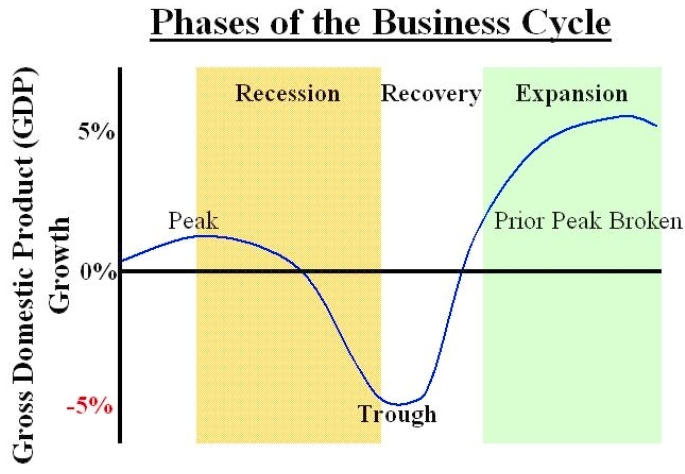 It provides techniques to invest safely for a recession, ways to keep your job during a recession, and how businesses can survive a highly inflationary economy. Take control of your financial future and don't be at the mercy of the markets starting TODAY! ...The next move is up to YOU to make. If you've read this far, you know that you have a strong interest in the real estate market bubble and the kind of true wealth that you really deserve. All that's left is to TAKE THE ACTION and do it! ...Then, you owe it to yourself to take full advantage of this limited, risk-free offer right now before it's too late, because I may increase the price and change some of the bonuses very soon. During marketing tests, a price of $35.98 was decided as the appropriate price for the valuable information in this eBook. But if you ACT RIGHT NOW, you may lock into the ONE-TIME low investment of only $11.88! Now, do yourself and your financial future a favor - invest in the eBook today! Yes - I want immediate access NOW! I am ready to learn how to prosper in and protect myself from the changing real estate market! I understand that using the real world, tried-and-tested, proven strategies and techniques taught in the easy-to-understand How To Prosper In The Changing Real Estate Market. Protect Yourself From The Bubble Now! eBook is the fastest and easiest way to do it. I understand that I will get IMMEDIATE ACCESS to the eBook, and all three 100% free bonuses once my credit card is successfully processed. I understand that I can pay the RISK-FREE, one-time only investment of $11.88 with my Visa or MasterCard. I understand that my credit card and personal data is 100% SAFE AND SECURE as the order is processed by GoDaddy.com and Intuit QuickBooks Merchant Services, using industry-leading SSL ENCRYPTION technology. I also agree that you have not made any promises or guarantees, whether stated or implied, that I will produce any specific result or income as a result of reading your eBook. Finally, I understand that my purchase is covered by your PERSONAL, RISK-FREE, NO-B.S., NO-QUESTIONS-ASKED 100% SATISFACTION GUARANTEE, FOR 90 DAYS. If I am not completely satisfied within the first 90 days, I may request and get a full refund, ANYTIME, no-questions-asked. Buy the eBook anytime and get instant access, even if it's 3 AM! You can also feel good knowing that 10% of all profits go to a Miami, Florida charity to feed the homeless (CPA audited). In today's uncertain economy, leaving your financial future to chance just won't cut it. You need more than that. You need real world, tested and proven, actionable strategies and techniques, and tools. We are living in the information age where knowledge is power. 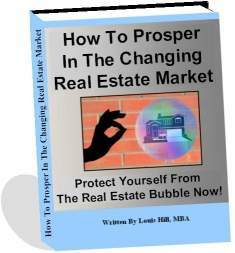 How To Prosper In The Changing Real Estate Market is the only eBook that will provide you with all the knowledge, tools and resources to make the right choices. That way, you will get your financial situation on a fast track to a healthy financial future as quickly as possible. With the most revealing eBook of its kind on the market today, do you think you can make the choices needed to be made before it is too late? You bet you can! You could easily set yourself up for life by taking advantage of this opportunity. Many people have done it already. Get the eBook today. You will not regret it. P.S. Are you still skeptical? I fully understand. So then, let me add something extra special to sweeten the deal. Get the eBook today and I'll throw in complimentary LIFETIME UPDATES! Whenever the eBook is updated, you'll receive a complimentary copy. It's yours ABSOLUTELY FREE, but only if you get the eBook TODAY! “I can honestly say that this is the best summary of the housing bubble I have come across, and I read a lot." "I will praise the book and recommend it." P.P.S. Lastly, even if you ask for a refund ANYTIME within the next 90 days... even if it's on the very last day of the guarantee period... you will receive it promptly, with no questions asked. I look forward to you having a strong financial picture, because if you don't, you are risking too much! Copyright © 2005-2012 OutstandingEBooks, Inc. All Rights Are Reserved. 3487 Cocoplum Circle, Coconut Creek, Florida 33063.